It’s hard to believe we ever wanted to kill the Nigh-Infinite Serpent. I mean, I don’t know how you do that, and neither did the Ancients, since every bomb they invented never even sloughed its old skins. But I’ve got fat books full of stories of great knights and cyclopes who braved the mountains of the world trying to kill the Nigh-Infinite Serpent. 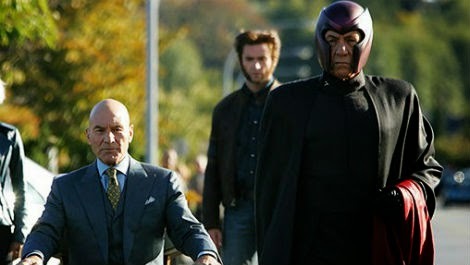 Their bravery made for great tragedies, even if these days they only get adapted as comedies. You have to be very brave to fight something that can and frequently does encircle the continent. Every Winter the nights get longer, not because we’re tilting from the sun, but because it’s shifting in the sky trying to warm up. You might as well try to arm wrestle an earthquake. Also, fighting it caused a lot of earthquakes, which is why the Moderns outlawed fighting it. There was this one whole crusade that climbed up to the Nigh-Infinite Serpent’s mouth, using a combination of apatosauruses and gryphons for travel, just to die bravely and go to Ten Heavens. This was in the second dynasty of the Moderns, who dispatched one thousand runners to chase them and hand of the writs of cease-and-desist. It was bound to be an epic, and an epic against the serpent would probably wreck the entire continent for us. So the crusade had to turn around, because if they broke the law then their dead souls would never get into Ten Heavens. Except they were so high up that they had to march down the Nigh-Infinite Serpent’s spine – there was no easier way. And marching around up there, the crusaders found there really was no more convenient way to get anywhere on the continent than by walking on the serpent. It was lying about so much of the world that some of them even visited islands cartographers had deemed lost and mythical by hopping off its tail. You can tell which regions were the first to bribe the Nigh-Infinite Serpent into playing highway because they’re still rich as cake today. Ornithologists were conscribed to trick flocks of rocs and gryphons into straying past the Nigh-Infinite Serpent’s mouth, giving it ample sustenance, and for every load it would contort its amazing body, a length becoming a new bridge or tunnel, sometimes running two or three highways on top of each other if the bribe was plentiful enough. When the Moderns factored in the reduction in wars with nature and no longer needing to construct or pave highways, they considered bribing the beast to be an exceptional savings. Nowadays it actually gets angry if people aren’t traveling on its hide, which is why it attacks so many aircrafts. The best we can tell is it’s used to all the traffic as a sort of back massage. I work in automobile manufacturing, so I don’t mind the anti-aircraft strikes, but the delays on the highway are miserable whenever the beast sheds. I had the great pleasure of attending my first Broadway play last week. 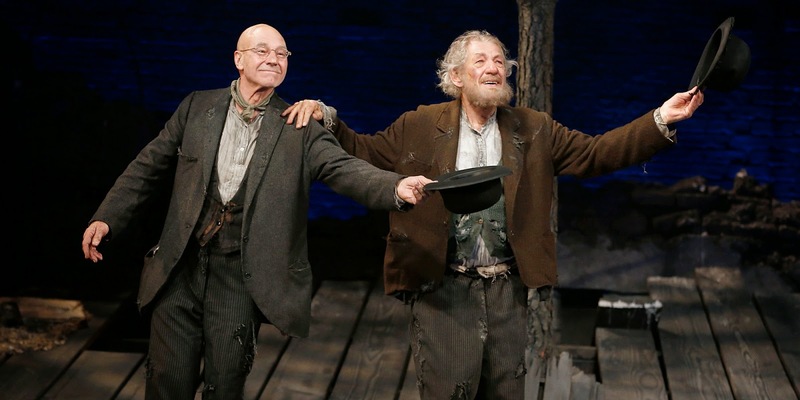 It was Ian McKellen and Patrick Stewart in Waiting for Godot, which commanded the sort of cast I’m told you don’t usually get even in New York City. Thanks so much to Ross Dillon and Max Cantor for having me along with them, I, some Philistine who wasn’t sure Broadway was even a real place. It turns out is a place, like a lot of New York City, that exchanged the sky for glowing billboards, making it a fine place to watch two great actors ask each other if life is really happening. It was a wonderful production. Shuler Hensley played Pozzo as a hooting Texan, which I’d never imagined and immediately adored. Billy Crudup rounded out the cast and completely nailed the role of Lucky, from his weary swaying to that impossible monologue on everything and nothing. There came a point when, as an exhausted Pozzo prepares to leave, Lucky took on a knowing expression and caressed his chin in a way I can scarcely believe they got to work on stage, with Crudup blocking so much of our view and facing away, and yet sharing his expression with a crowd behind him. That’s the level of craft the foursome brought to the play. 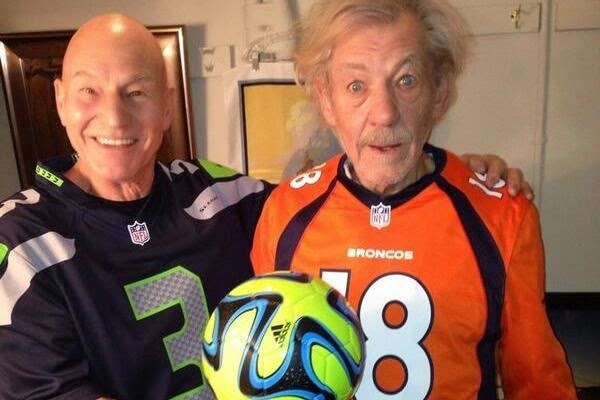 Shame on me for my highlight coming out of the non-superstars, but McKellen and Stewart were as sterling as you’d expect. McKellen is the more versatile performer, and here played Estragon with so many senile and demented notes, all with the weight of immense age, that reminded me keenly of my grandfather’s final years. Even gestural suggestions of senility were perfect for Waiting for Godot, and particularly for Estragon, who has to forget so much of what’s allegedly happened in front of us. It detracts from my reading of the play as raw nonsense, deliberately eschewing its own continuity to make points about post-modernism, and yet it fits to humanize the material. I love when good actors read material differently than I do. Art isn’t worth it if we all agree. Then it becomes Heinz ketchup. Also, I love Heinz ketchup. McKellen got me thinking about other interpretations of the work, and inspired a vision that can never be: Waiting for Adventure Time. The cartoon is often absurd, but that’s a credential for this kind of mash-up, and is so often about exactly the kind of baffling logic that, here, Vladimir is infuriated with for not working. On the subway ride out, I pitched it to Ross and Max, with Finn as Vladimir and Jake as Estragon, and likely animated by the same crew. They won’t even have to switch backgrounds. Any number of Adventure Time voice actors would fit Pozzo, while if we’re going to get anyone to do Lucky’s monologue, it’s got to be Lady Rainicorn running it in Korean. The play has that elemental nonsense about it, that honestly does remind me of Adventure Time. Adventure Time follows a contrived internal logic, something unreasonable and that children don’t know isn’t acceptable yet. Waiting for Godot is about a grown man’s inability to deal with that lack illogic. An easy highlight of the show was arguing with my friends over its potential meanings as we were stuck in the stairwell trying to exit the theatre. That’s another highlight right there. You can get angry, or despair, or relish in gifts like those. March is on its way out and maybe, just maybe, spring is coming. My boiler is busted and winds are rattling my walls, so it’s cold enough inside that it still feels like winter. Winter is a good physical state to read some angry Russian novels. Mikhail Bulgakov’s The Master and Margarita is probably going to be on my #bestreads list at the end of the year. It’s a unique novel and excellent in too many ways, the greatest being that it somehow balances all those ways without losing them. It’s political and religious satire, it’s sincere literary soul searching, it’s mad-cap adventures. Its tone changes on the scene to feel like it’s bridging worlds usually separated by genre. It’s one of many little atheistic editorializations that never seem to get flagged or cleaned up on Wikipedia. This is a particularly stupid one, as having read fifty pages of the novel you know Woland’s agents wouldn’t destroy the world because they don’t spend all their time here and they enjoy its excesses. Woland visits us so seldom that he’s baffled (and then elated) that the Soviets disbelieve in him. And near the end, the devil speaks with a possible superior (guess who) who seems able to get him to change his actions for the kinder. It’s unbecoming when a line on Wikipedia bothers me for weeks like that, but at least I can get that out of my system, just like Woland got earth out of his. If I have a regret about the novel, it’s that I read it while writing so much of my own. Composition takes up so much of my mind that often I couldn’t pay The Master and Margarita proper attention and would hold it off to a weekend or a travel day. I read half of the novel on trains headed towards Waiting for Godot, and it was a delightful experience, but it felt like it deserved better. It’s definitely one I’ll revisit in multiple translations.